Just a short post. Dad had a big stroke and is slowly fading away. The whole family is here and are being supportive, nurturing, polite and hilarious as only they can be. I sat awake all night last night watching Dad breathe. It was strange and good and awful and dear. Some day I will try to capture it in words. Update: He passed peacefully yesterday about 3 pm. We were all there. Rest in peace, dad, and have fun with Laura. Not that I need help looking like an idiot. But Facebook has given me a new way to be awkward. 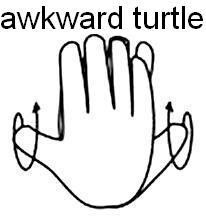 Aside - do you know the Awkward Turtle sign? I went on The Facebook and found, in my friend requests, a person from my childhood. He was a neighbor kid but his sister was my age and his older sister dated my brother for a while. I thought "That's weird," but what the heck. I mean, he's from the old neighborhood, so I clicked "Confirm." And then Facebook said "Friend Request Sent." I did not want this guy as my friend. I have barely thought of him in 35 years, but I assumed he was keeping in touch with my old circle of neighbor people and he wanted me to be included too. Apparently not. Apparently FACEBOOK decided randomly to stick him in my friend request list so I could embarrass the hell out of myself. The guy is going to think I am insane or trying to build a massive friend list...And there's no way to take it back. Is this a feature?That someone thinks I need? I'm making the awkward turtle right now.